Welcome to Day 16 of the 31 Days 31 Printables series. If you’re just joining us, I’m spending the whole month of October sharing at least one free printable each day. 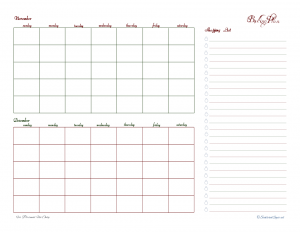 Right now I’m working on updating my holiday planner printables, there are only a couple more that I want to update for you this month, and then we’ll be moving on to some other ones. Today I’m taking my lead from yesterday’s post and carrying on with printables related to holiday food. 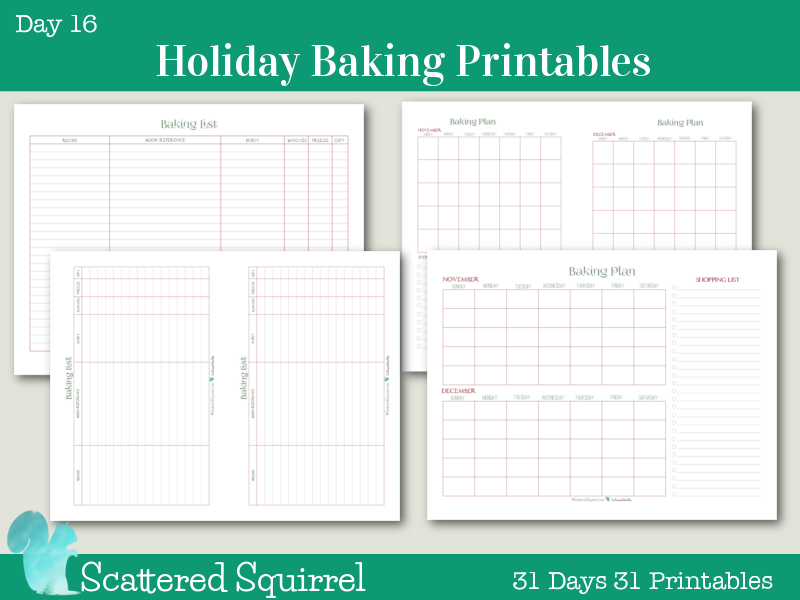 Without further ado, please allow me to introduce the Holiday Baking Printables Collection. Holiday baking is one of my favourite ways to celebrate the season. It may sound silly, but there is something so homey about baking up special treats we only eat during this one time of the year. It adds a magical element to the whole process. In many ways, it’s like Christmas music for me. I wait all year for Decemeber 1st to roll around so I can start playing the Christmas tunes. (Yes, I wait until the 1st, but after that my family has to suffer with holiday music every day until Christmas) Unlike Christmas carols, I start my baking in November depending on how much space I have in the freezer and whether or not we have a bunch of get togethers planned. Planning what I’m going to bake ahead of time helps me save time and some of my sanity later on. 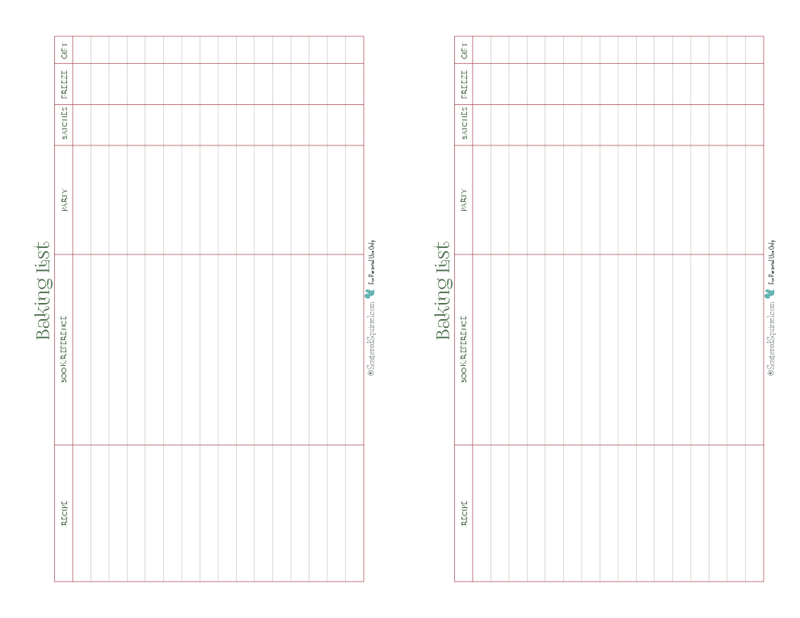 Below is a peek at the two printables that are getting a new facelift today. 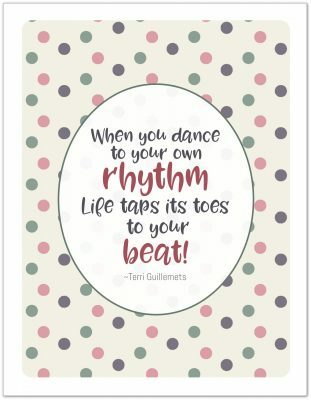 The two printables I’m sharing today have been updated like most of the others. New fonts, new colours, and a few tweaks to one of the layouts for its half-size version. 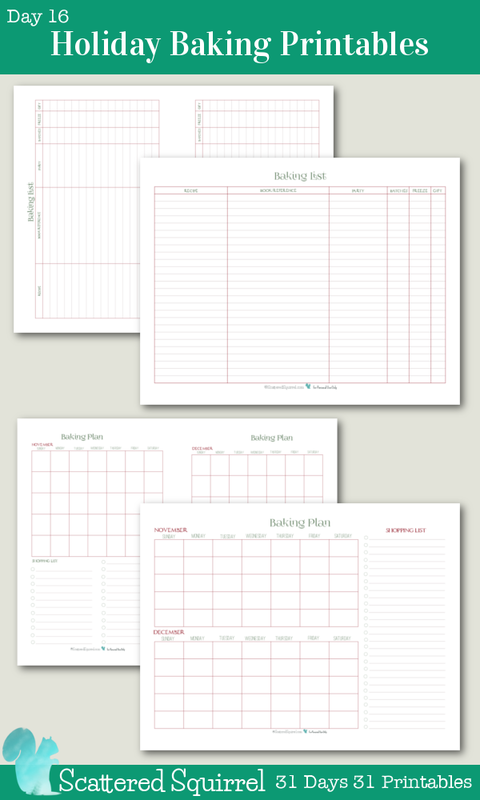 As I’m going through the printables I’m realizing that some things are just better being kept simple. As much as I want to change everything up, I worry about losing some of the functionality in favour of something more pretty and artistic. The part of me that craves organization is most definitely winning this battle of function over form. 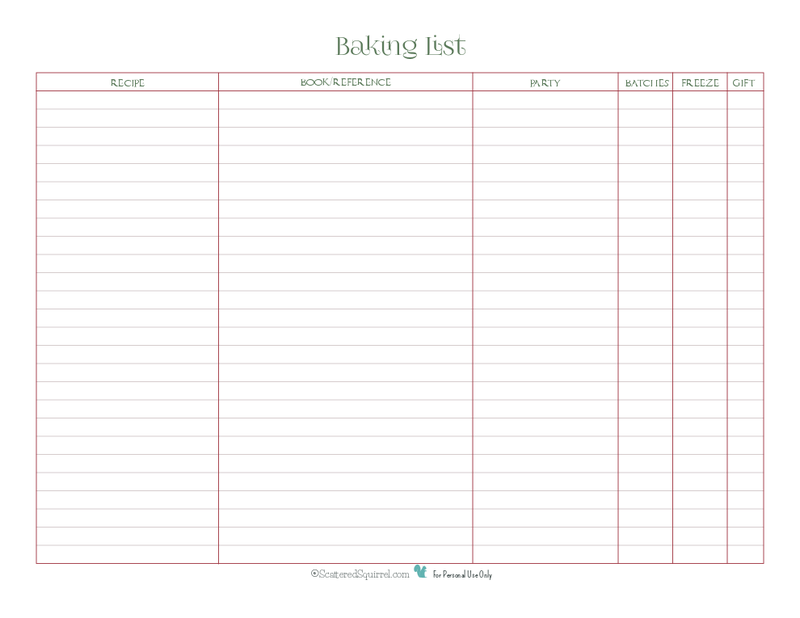 The Baking List printable helps me keep track of what I want to bake each year. I can use the family favourites printable to help make sure I have a little bit of something that everyone loves. I also use this list to plan which goodies can and will be stored in the freezer, which ones I’m making as part of a gift, and in the event of a pot luck get together, what party I’m making them for. 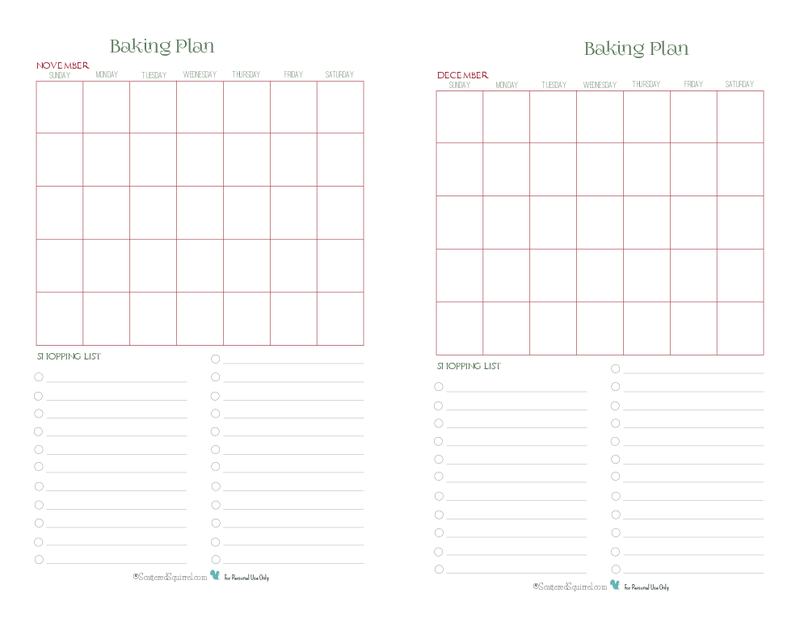 The next printable to be updated was the baking plan printable. To be really honest, this one wasn’t on my list of ones to update. 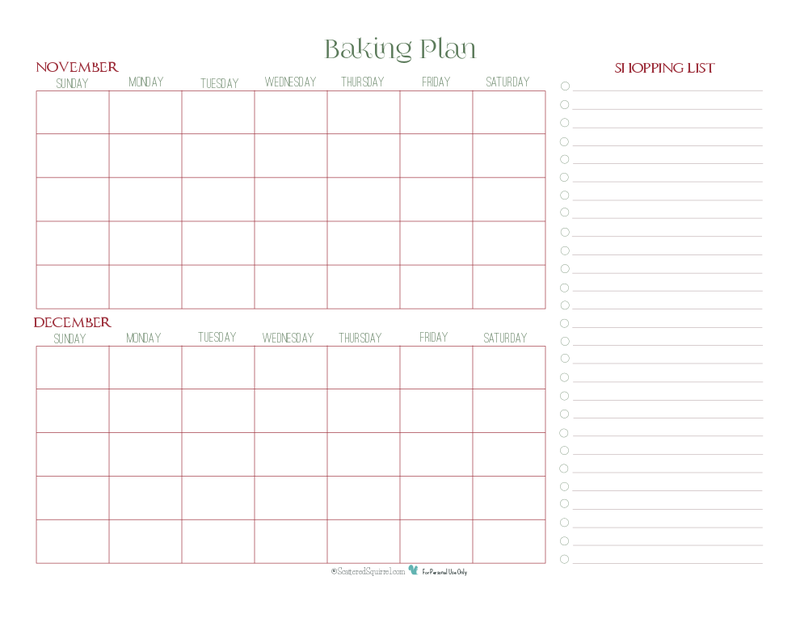 I tend to use my regular calendar for planning out the baking, and I wasn’t really sure anyone used this one. Then I was talking with a friend of mine and she told me I just HAD to update it. I love the new colours and fonts you’re using, and I use your baking plan printable EVERY year! You have to make an updated version, even if you only make it for me. If you don’t …. I’ll disown you!!!!!! Well, I couldn’t bear the thought of upsetting a friend, so Em, this one is all for you. You just have to share with everyone else! 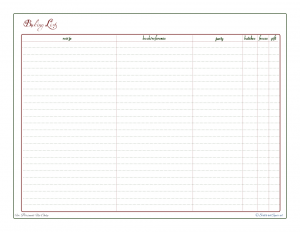 Just like the other holiday planner printables, these two have a half-size version too. Baking is one of my favourite things to do during the holidays. I love the way my home smells when I’ve got something yummy in the oven, not to mention how cozy the kitchen and family room feel with the warmth from the oven keeping away winter’s chill. And I love that the whole family gets involved. The boys love to help, each in their own way. Travis bakes better than I do, and he enjoys being in the kitchen when he can. And I just like making yummy things to eat and share with family and friends. I would even go so far as to say that though the goodies may (sometimes) change from one year to the next, the making of them is one of our dearest family traditions.